Welcome to Angkor Century Resort and Spa, a 5 star deluxe resort property set within lush tropical gardens covering an area of 9 acres. A mere 15-minute drive away from the Airport and the Angkor Temples, it is located within the heart of Siem Reap. Its interiors are a tasteful blend of contemporary western conveniences and artistic and elegant Khmer design. Widely respected by its industry partners, colleagues and very regular guests for its high quality of service, it is an award winning property, having received citations from the World Travel Awards UK (2003 and 2004 Leading Resort and Leading Spa accolades) and the Trade Industry Golden Trophy for the year 2005 from Spanish Trade Leaders Club. Guests may select from 190 stylishly appointed rooms that suit and reflect the individual needs of both business and travellers alike. 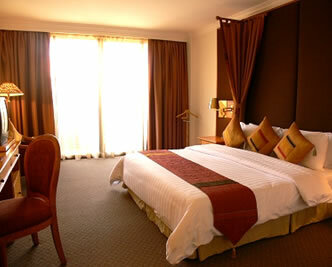 Angkor Century Resort and Spa provides with all comforts and amenities of a first-class international hotel. The relaxed atmosphere and the rich colors of an 8-acre tropical garden will complement your trip to Angkor Temples and will create memories that will last a lifetime. Angkor Century Resort & Spa in larger map.